Intel Spectre and Meltdown security and vulnerability issue. Razer is aware of the recently discovered security issue affecting microprocessors used in laptops and desktop computers, including our own. To combat these vulnerabilities, updates are needed for the computer's operating system and the firmware of the microprocessors. Recent updates to the Windows OS were put in place and it is highly recommended users install all available Windows Updates to their desktop computers or laptops. Razer has released system updates to specific models of Razer Blade Laptops that have been affected by this vulnerability. Please click here to view all available updates and installation instructions. More details regarding this issue can be found at Facts about The New Security Research Findings and Intel® Products. Is there a security update for the Intel ME firmware for my Razer Blade Stealth 12.5" (2016) - Intel 7500U? Razer has released a firmware update to address the security issues related to the Intel Chipsets on some Blade models. You can download the latest firmware and installation instructions here. How do I replace the battery in my Razer Blade Stealth Laptop? Razer Blade Stealth batteries should be replaced by an authorized Razer Repair Center. Should you feel your battery is defective and needs replacing, please contact the Razer Support team here and we will be happy to assist you. I am hearing excess noise or coil whine coming from my Razer Blade. To address this issue, please download the software update from HERE and follow the instructions accordingly. Please contact us HERE for assistance if the issue persists. At times when I suspend and then resume operating the computer, I hear some audio distortion/noise from the system speakers on my Razer Blade. Please download the update from HERE and run the updater accordingly. The battery on my Razer Blade Stealth is not being detected or will not charge. If the laptop has not been in use for an extended period, the battery may stop charging if drained below normal operating conditions. In most cases, the battery is not defective but your system will require a software update to address this issue. After the software update is applied to your laptop the battery should resume charging again. My Razer Blade Stealth will not charge when plugged into the AC adapter, and the green LED is lit on the AC adapter. Please unplug the AC adapter from the wall outlet for approximately 30 seconds, then plug the AC adapter back in. If the issue persists, please contact us HERE. 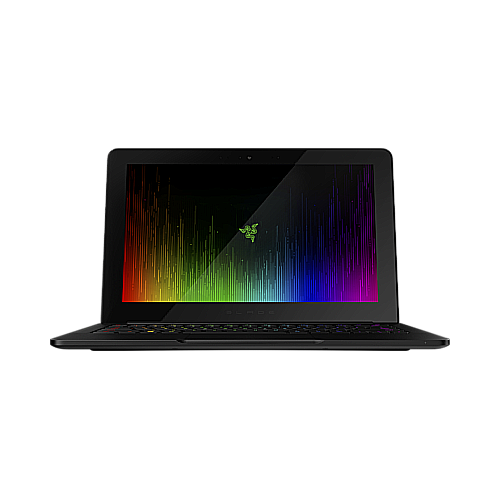 How can I extend the battery life of my Razer Blade Stealth when on-the-go? In addition to turning down the display brightness and adjusting the power settings, tweaking the lighting effects of the Chroma keyboard can help maximize battery life. Here are some tips for extending your travel time when going in Stealth mode. What do the different colors on the Blade Stealth LED status indicator mean? The front LED indicator shines depending on the status of the Blade. When the system is on and in use, the LED will normally be off expected under the conditions mentioned above. The LED will also not light when the unit is turned off, even if the adapter is plugged in and charging. If you encounter this, please try to shut down the system and power it on again. If this still does not work, please uninstall Synapse and download the latest Synapse Framework from Razer support site. Can I dual boot, partition, or otherwise modify the Blade’s operating system? The Blade is designed for compatibility with the as-shipped OS. Should you want to install or modify the OS Please first format the boot drive then install your OS. Razer Warranty and Support is only available for the as-shipped OS. My Razer Blade is out of warranty, how can I have it repaired? Razer has authorized repair centers in every country where the Blade is currently sold. To set up a repair at one of our repair centers please contact our support team at www.razersupport.com/email. Our support team will be happy to give you a rough estimate of the repair costs, but final costs cannot be determined until the unit is physically inspected at the repair center. Only authorized Razer Repair Centers will have the parts and specialized training required to repair your Razer Blade. Can I use third-party power adapters? We only recommend using Razer power supplies with the Razer Blade Stealth. Third party adapters have not been tested to meet our standards and may lead to damage to the System. You can purchase replacement or spare AC adapters from our website here. The warranty length for the Razer Blade Stealth (2016) is 1 year. Please see full details for warranty lengths: here. How can I contact Razer Support if I'm having problems with my Razer Blade? Please visit www.razersupport.com, email systems@razersupport.com or call System support for your region with one of the numbers to the left. How do I use the additional functions indicated on my keyboard? In order to take advantage of the additional functions on the Razer Blade, hold the "FN" key and press the specified function key. My internet or Wi-Fi connection indicates that I am connected to the network but I am unable to connect to the internet. What should I do? Most modems have and an indicator that shows if it is connected to the internet, check if your modem is connected to the internet. If your modem does indicate that you are connected to the internet, try restarting your modem. If you're still having issues please contact your local internet provider to ensure that the connection is stable. Will I void the warranty by opening or upgrading my Razer Blade's components on my own? Any damage or issues caused during installation or as a result of incompatible parts being used is NOT covered under the warranty and may void the warranty coverage. Will the Razer Blade be compatible with other Synapse 2.0 devices? Yes, any device that is Synapse 2.0 ready will automatically sync your custom settings with the cloud. If you were unable to find the answer to your question(s) in our FAQ, please don’t hesitate to contact us here or call us with the phone number for your region at the left. Razer Systems must be repaired at an Authorized Service Center, please contact our System Support team with the phone number for your region at the left to arrange for repairs. From your shopping cart page on the Razer Store, please check the box labeled “Enter Promo Code.” Enter the code into the box and click “Apply Code.” The total price should reflect the discount. If you were unable to troubleshoot and resolve any issues you are having with the knowledge base (FAQ) and you feel your product is still defective, please don’t hesitate to contact us here or call with the phone number for your region at the left. If you’re unable to find an FAQ article that helps resolve the issue, please contact your local Razer System Support Team by viewing the links the left side of the page. User guides and product manuals are also available on the Support page. Razer must verify that the product is within the specified warranty period and that it was purchased from an authorized reseller. Products purchased from unauthorized dealers are often used, counterfeit, re-boxed, defective or gray market goods. These units may also not be designed and packaged to work in your country and may not meet all legal and safety requirements. Razer will not be able to honor a warranty on products purchased from an unauthorized dealer or that are out of the warranty period. If you purchased a product from an unauthorized reseller, all support and warranty issues should be directed to that reseller.